News > 2016 > 2016 income tax clinic: 1,500 tax returns completed by 325 student volunteers! 2016 income tax clinic: 1,500 tax returns completed by 325 student volunteers! The 2016 income tax clinic at HEC Montréal, from April 1 to 4, was once again a great success! All in all, 1,500 tax returns were completed by 325 student volunteers, to help newcomers, low-income taxpayers and fellow students. The free event not only allowed the School’s students to acquire some targeted tax knowledge, but also provided valuable assistance for the Montreal community. The clinic, organized in co-operation with the HEC Montréal Société de relations d’affaires, Revenu Québec and the Canada Revenue Agency, was open only to individuals with annual incomes of less than $25,000 and families and couples with annual household incomes of less than $30,000. Another free income tax clinic was held on March 17 and 18, in co-operation with L’Itinéraire, in the offices of the community organization. That clinic was an independent initiative by eight HEC Montréal BBA students. Organized in just one month with Revenu Québec, the Canada Revenue Agency and HEC Montréal graduate Jean-François Morin-Roberge, a sociocommunity officer with L’Itinéraire, the clinic was a pilot project, open only to vendors of L’Itinéraire magazine, and helped about twenty people in need. The students are already working on a future edition and to set up the structures to make it a regular event. Thanks to all these volunteer students for their social commitment! 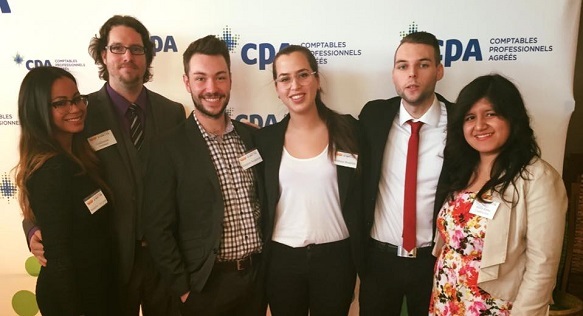 The directors and co-ordinator of the 2016 income tax clinic: Leandra Santana, Guillaume Ouimet, Stephen Bergeron, Yesmine Boukhili (co-ordinator), Louis Bordereau and Maria Cuadra. Photo: Léa Sénéquier.